As an ENT trainee, it is always difficult to have decent, stress free time to sit down recalling 'back to basic' knowledge with the condensed training and tight working schedule. A dissection course is undeniable a valuable teaching resource but it always pricey. It is indeed grateful that APOST provides scholarship to nurture the surgeons of next generation to practice safe, effective and appropriate procedures. The provided full body cadaveric dissection indeed leads us to an in-depth understanding of the topographic clinical anatomy of the head and neck. Brilliant clinical pearls and tricks provided by the friendly and experienced surgeons (facilitators) result in propitious environment in acquisition of good surgical techniques. Through the comprehensive course, all participants are able to appreciate the three-dimensional perspective; the structural organisation and relationship of tissues and organs; a perception of the depth, fragility and variability of anatomy; the steps in specific surgical procedures; and a sense of how anatomical structures feel. There is a saying that “mistakes are doorways to discover”. However, the only mistake that a surgeon affords to pay is through cadaveric dissection. I recently attended the Head&Neck Cadaveric dissection workshop organized by APOST. I must say that the course was a great success . Many of the participants (including myself) learnt many new tips and techniques for our surgical practice. The precision and the operative surgical steps were well thought to us. All the faculty members guided the participants patiently and methodically – a HUGE plus point for junior surgeons like me. I must say I felt the course was executed well , with no glitches at all. As an operating surgeon, I believe self- confidence is a must. With regards to this, I have to say that by attending this course organised by APOST, it has boosted my confidence in being safe and precise when I perform my future thyroid surgeries. I think the course was fantastic and was organized extremely well. It was a great collaboration between APOST and University of Chulalongkorn. I was very pleased with the course as a whole. The cadaveric dissection was excellent and really is worthwhile. I am much grateful to APOST for giving me such a wonderful learning opportunity. Thank you very much . First of all I would like to thank Professor Micheal Tong and the Apost’s broad members for giving me the opportunity to take part in the head and neck dissection course in Bangkok on 12 to 13 November,2018.. This is a very useful and practical course, which gives me a better understanding of the head and neck structure as well as the opportunity to perform almost all surgeries in this area. I have took part in many head and neck surgeries before, but only as an assistant, after the course I feel more knowledgeable, more confident about head and neck anatomy and hope to be able to perform these surgeries myself in the near future. I was very impressed with the facilities, equipment and people at the Chula Soft Cadaver surgical training center. The cadaver are well preserved, the instruments are fully equipped and the fastest support when needed. I greatly appreciate that. About the course, I like the short lectures, just enough to reserve time to the hand-on. The lecturers are very enthusiastic, young and good, willing answer and teach me everything when I practice on cadaver. And lastly, I would like to thank the Thai people for their enthusiasm, which helped me a lot in the 2 days here. Especially thanks to Charlotte Chan, who contacted me, helped me, supported me from the beginning. It was glad that I was given opportunity to participate in this well-known head and neck dissection course. I have gotten to learn from various experienced surgeons all over the world, especially on the all the tricks in head neck surgeries. This gives me a lot of confidence in doing all kind of head and neck surgeries now. Importantly, it was a good platform for me to get to know ENT colleagues from all over the world, so that we could be in contact for the future and to share experiences when we encounter complicated cases. I feel that I was very lucky to join this programme and hope to come back again in the future to gain more updated knowledge. I sincerely hope that APOST workshop can be held continuously for years to come to train junior ENT surgeons to achieve certain level of competency. This was my first time attending a dissection course organised by APOST, and it was a fantastic experience from start to end. It was well organised, comprehensive and had just the right balance of didiactic and dissection time. I am a 4th year ENT resident from Singapore and am just starting my journey in head and neck surgery. This course helped me to refine techniques at various steps of surgeries, from designing skin flaps for parotidectomies (not to go too near to the sulcus, not to exceed superior border of external auditory canal), to tips on identifying the recurrent laryngeal nerve in thyroidectomies. It also broadened by horizons, as I learnt about transoral thyroidectomies and mandibulotomies that were performed with a stair step cut which would help with better reapproximation. It was definitely exhilarating that I had the opportunity to try my hands at more advanced head and neck surgery such as maxillectomies and laryngectomies. Most importantly, the dissection helped me to understand and appreciate head and neck anatomy in a three dimensional way. Additionally, I had opportunity to meet and learn from faculty from the asia pacific region, and I am still keeping in touch with my dissection partner from Indonesia! I would highly recommend this course to all ENT trainees as an invaluable learning and networking experience. 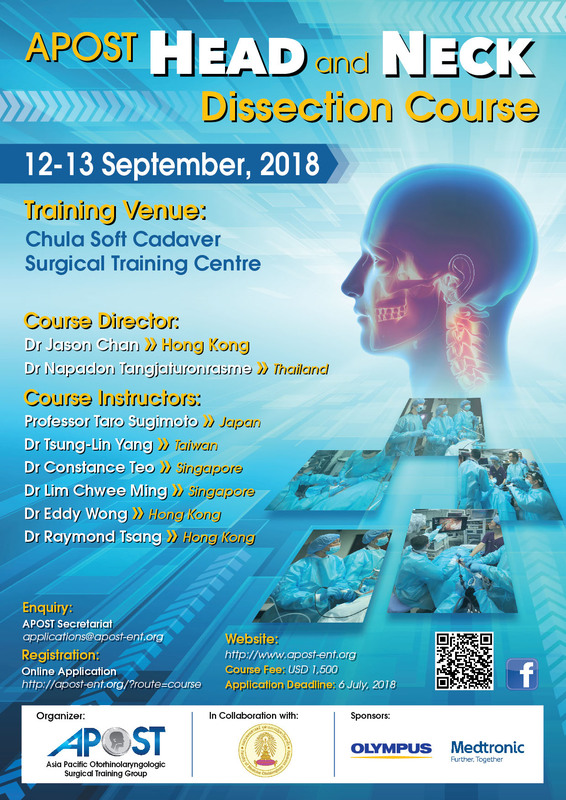 I m satisfied with that APOST Head and Neck Dissection Course which had held in 12-13 September, 2018 in Bangkok, Thailand.I suggest that training time is too short. So, more favour that the lecture and cadaver training time more than two days is required. I have satisfied with the clear and definite lecture programme and cadaver training. More favour that we will get lectures and demonstrations vedio files for future studying. Thanks you APOST to bring me there. I have get a lot of knowledge and experience to apply with patients. I have enjoyed every thing and a lot of fun there. I am really appreciated all things you have done for us.Hope to see all of you again.This is a really great time for me. It remain in my memory forever. Firstly, I am thank you all APOST members for giving me an opportunity to attend APOST Head and Neck Dissection Course, Bangkok, Thailand 12 -13 Sep 2018 and especially thank you Ms Charlotte Chan for her effectiveness in communication to each other and guiding us while we were in Bangkok. Secondly, The facilities of Chula Surgical Training Lab (CSTL) are very good and basic for the course. Also the cadavers are fresh, that is good for the dissection time. The assistants of CSTL are always standby for helping you. Thirdly, The organizer plan an concise agenda, not too much time for lectures. Most of the time is for dissection including all the techniques from basic to advance in Head and Neck Surgery field. The instructors performed carefully step by step all the procedures. The faculties were actively involved to teach us, when they felt you were stuck for doing dissection, they always joined and shared their experiences. Finally, the organizer will give us one of the technique videos and assignment to take note all the landmarks. It helps us to enhance the knowledge about the anatomy and the steps of surgery after studying, it is plus point in this course. " I absolutely love working with the APOST teams. I appreciate your attempt to share valuable experiences and provide training education of otorhinolaryngologic surgery with practical value and contemporary principles and techniques. All dissections are useful and valuable for me to learn, especially the “Transoral hemithyroidectomy” – which is a ‘scar-free’ surgery with minimal dissection and still not available in my country. I really hope that I will have more opportunities to take part in other workshops as I really enjoyed this workshop so much! Your course is tremendously useful! Thank you all your efforts for organizing such a fantastic workshop! I am already experienced good results in my work, thanks to your help. I would like to thank APOST for the opportunity given to attend such a transformational workshop. It was useful and an applicable course for residents such as myself. The materials and facilitations was excellent. I was satisfied by the by hands-on training and was grateful for gaining invaluable learning experience from the legendary surgeons. I will definitely recommmend the workshops organized by APOST to my fellow residents so that other residents and junior ORL surgeons could benefit from these courses. It is also my hope that APOST would continue to remain active and persevere on this journey to train as many residents and surgeons in this region. This training course is on the recent updates in the development of Head & Neck surgery. It comprises didactic lectures, demonstrations of surgical procedures presenting practical technicality and hands-on cadaveric dissection supervised by leading professionals, providing an educational platform for participants to gain knowledge and skills from the course and to keep abreast of the advances in the field. This dissection workshop targets junior ENT trainees who share an avid interest in the most recent advances of Head & Neck surgery. The application deadline is 6 July, 2018. Please send your CV to applications@apost-ent.org upon completing the online application form. Should you have any enquiries, feel free to contact APOST Secretariat at applications@apost-ent.org. The APOST Educational Scholarship is now open for application. 1. Successful candidates are required to provide their feedback (150-200 words) on the workshop to APOST Secretariat within 14 days upon completion of the training event in order to receive the scholarship. 2. APOST reserves the final right to the interpretation of all terms and conditions applied. To apply for the scholarship, please download the form below and return it to applications@apost-ent.org by 6 July, 2018. Have you done any endoscopic Sinus surgery as a chief surgeon in the past 6 months? If so, how many cases have you performed as a chief surgeon every month? Have you done any endoscopic Ear surgery as a chief surgeon in the past 6 months? Have you done any Head & Neck surgery as a chief surgeon in the past 6 months? What do you expect to learn from this/these course(s) ? Please submit your CV to applications@apost-ent.org after filling in this form.